At Gynzy we think it is important to listen carefully to teachers’ feedback in order to offer the best digital learning experience possible. During the last weeks we used teachers’ feedback to create some great improvements for Gynzy. In this blog we would like introduce you to one of the new features. This week, we would like to introduce to you, the the possibility to create your own shapes with borders. Why adding shapes with borders? Teachers have always loved using shapes in their lessons in order to make examples visual. Now, not only do you have access to a variety of shapes and colors, you are also able to give shapes a border with a different color than the rest of the shape and to have transparent shapes with just a border. This ‘shapes with borders’ feature will help you make your lessons even more fun and interactive. Below are three examples that you can use directly in your classroom. 1. Use the shapes feature in order to create graphic organizers. Help your students visualize the characters in a story with a story map, have a brain storm with a word spider. Or create a Venn Diagram to visualize overlapping fragments. 2. For the younger students you can use the shapes feature for recreating images. This will stretch your students’ insight in shapes, color and figures. 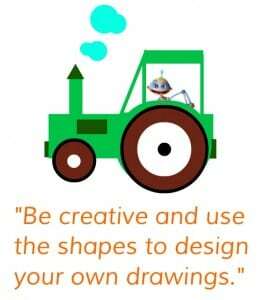 Be creative and use the shapes to design your own drawings. See an example image below. 3. With the shapes feature you can design various elements. For instance in a game for younger students where they have to drag the correct word into the right gap. How would you use this new shape feature in your lesson? Share it with us in the comments below. To use this feature, click on the ‘shapes’ icon in the toolbar and pick the shape, color and format you would like to use in your lesson.